My husband and I love food, and we are picky about the quality of what we eat. For nearly 10 years we have been members of a community sustained agriculture program which delivers a box of locally grown organic produce every week. One of the challenges of eating from a CSA box is that we often find ourselves with an over abundance of whatever is currently being harvested. If you love getting creative with vegetables, especially ones which are not commonly consumed in most American households, this can be incredibly fun. If you don’t, it can lead to tremendous amounts of compost. As a girl who never met a veggie she didn’t like, I enjoy the challenge of making veggies exciting and new. Greens including collards, kale, chard, mustard, arugula, and even dandelion make regular appearances on our table. This week, I found myself with two huge fennel bulbs. I love the crunchy licorice flavor of fennel, but more mature bulbs often have a woody texture which I find unappealing. Since this particular batch of fennel seemed like it had been in the ground for some time, I opted to cook it rather than chop it into our salad. I was making a fish dish with a lemon and olive relish, and I already had lemons out as I was figuring out what to do for sides. This recipe is what evolved. It took about 30 minutes to prepare, most of it simmer time. 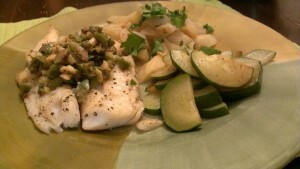 The end result was a lemony, sweet, melt-in-your-mouth veggie delight which perfectly complemented the fish. Served with a fresh salad and a chilled bottle of Viognier, we enjoyed a fabulous mid-week meal. Coarsely chop the onion. Melt the butter in a medium (2 qt) saucepan or skillet over medium-high heat. Add the onion and cook, stirring occasionally until the onion begins to brown, about 5 minutes. 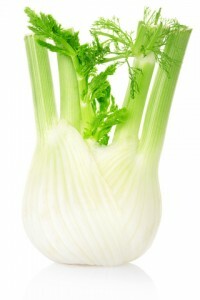 While the onion is browning, slice the fennel bulbs into quarters, then slice each quarter into 1/2 inch slices. This will lead to coarsely chopped fennel. Slice the lemon thinly, then chop it(skin and all) into small bits like confetti, removing the seeds as you go. Add the fennel and lemon to the onion, and stir fry for about 2-3 minutes until the fennel, lemon, and onion are well combined. Add the broth or boullion and water. Give it a good stir, then cover, reduce the heat to medium low, and simmer until the fennel is tender. This will take about 15 minutes. Add salt and pepper to taste, sprinkle with the chopped parsley, and serve hot.